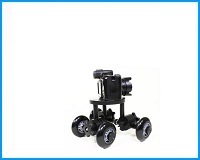 The MICRODOLLY SKATER DOLLY is a perfect bit of Kit to have when you travel. It weighs less than five pounds (2.2Kg) and will carry up to 50 pounds. It will dolly in a straight line or turn at any angle. It can even spin in a perfect circle centered on itself. The DOLLY uses our Universal Camera Plate. 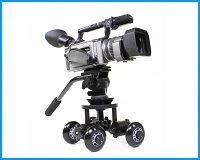 So, if you already have a MICRODOLLY CAMERA MOUNT KIT you need only to add the SKATER DOLLY wheels and axels. 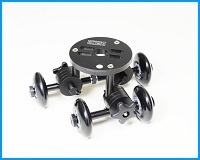 Or, you may purchase the SKATER DOLLY KIT which has the Camera Plate plus everything you will need. These behind-the-scene videos show many ways this unique Dolly can be configured. See why the MICRODOLLY SKATER DOLLY is fast becoming one of our most useful and popular products! 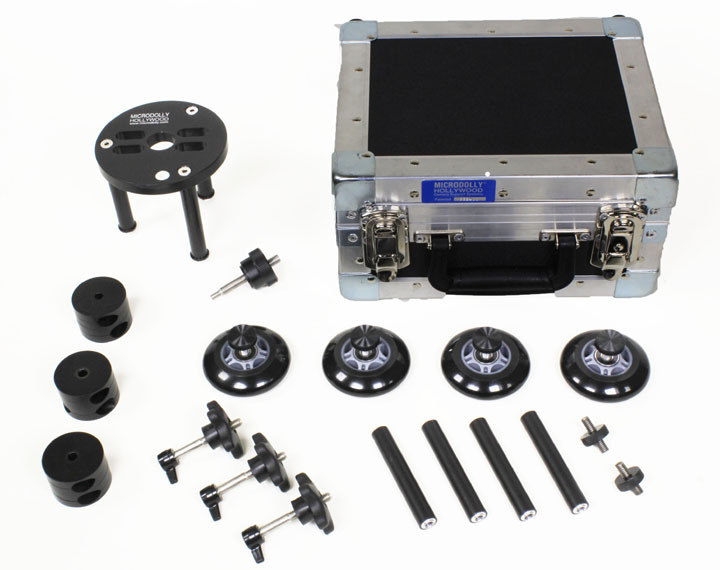 This KIT contains everything to assemble the MICRODOLLY SKATER DOLLY. 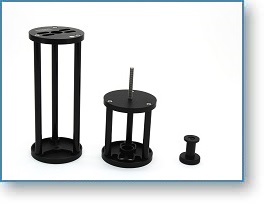 Made of sturdy structural-grade aircraft aluminum and non-reflective black anodized for long wear, the three leg Camera Plate comes with three Universal Leg/Axel Clamps and four axels. 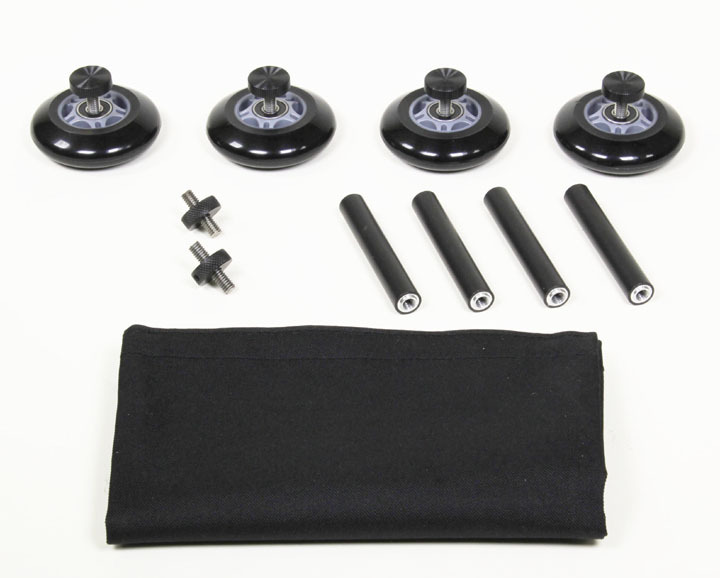 Two axel connectors, four stainless steel axel bolts and four stainless steel bearing dolly wheels complete the KIT. Everything is securely packaged in a custom made, foam fitted, steel rimmed hard case. 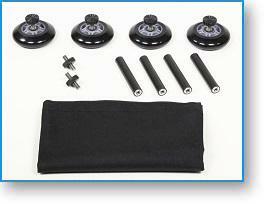 Designed to convert the MICRODOLLY SUCTION MOUNT Camera Plate into a MICRODOLLY SKATER DOLLY, this Kit has four axels, two axel connectors, four stainless steel axel bolts and four stainless steel bearing dolly wheels. 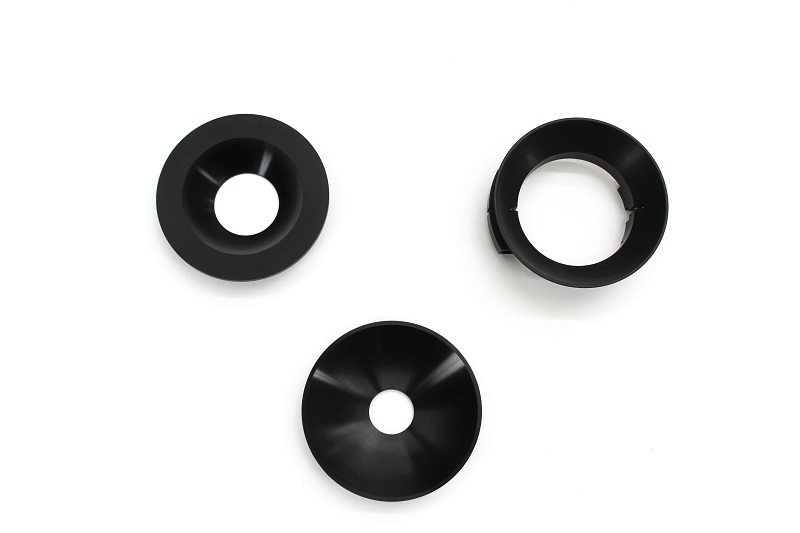 Made of sturdy structural-grade aircraft aluminum the axels are non-reflective black anodized for long wear. A handy carrying pouch is included. Designed to assemble in seconds, the Riser Kit allows you to raise the Jib or camera those extra few inches necessary to accomplish a shot. 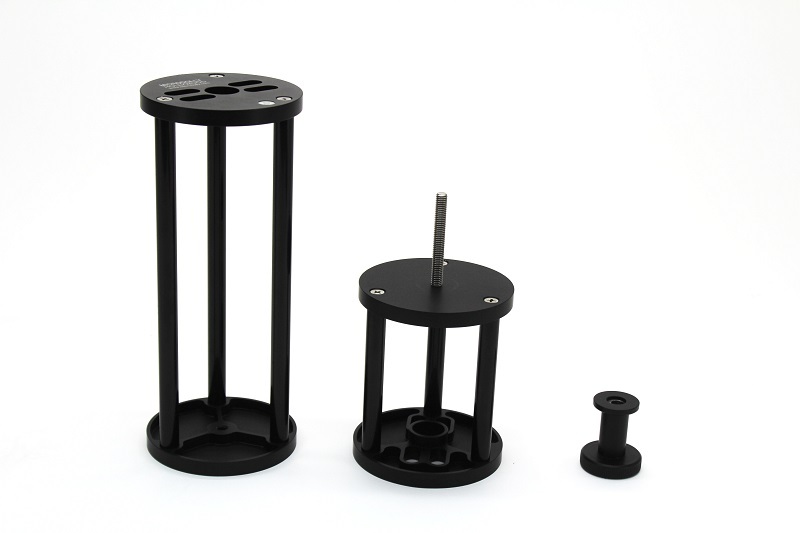 Kit includes three six inch and three 12 inch legs, two end plates, six mounting screws and a 5" stainless steel threaded rod. A MICRODOLLY Reversible Camera Knob fits all professional cameras. A screwdriver for quick assembly and sturdy carrying pouch is included. 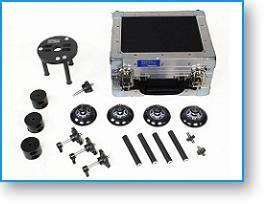 The Cup Adapter Kit will allow a wide range of Pan/Tilt heads to be mounted to the MICRODOLLY Pro Line of Jibs, Dollies and Mounts. 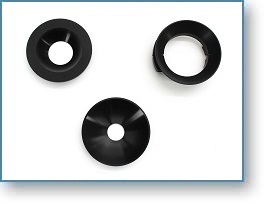 The Kit comes with a 100mm Cup and includes a 75mm and 150mm Cup Insert. It will attach easily to the Hi-Hat, Jib, or Standard MICRODOLLY Tripod. 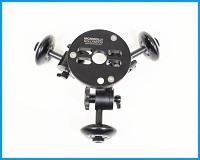 It will also attach to any MICRODOLLY Camera Plate Accessory. Made of sturdy structural-grade aircraft aluminum all parts are military-spec hard-anodized for long wear.